Even if the project feels like it has been dead in the water, Fox is still looking to make the Gambit movie that Channing Tatum sort of willed into existence. Or at least willed into development. 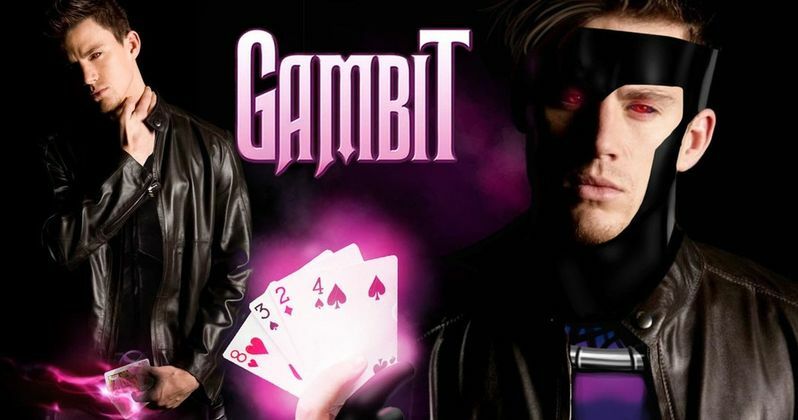 The movie has made little progress, but Tatum has provided an update and assures that Gambit is still coming. Though, they have had to completely start over. The actor recently spoke with HeyUGuys and revealed quite a bit about the proposed Gambit movie, which has faced a seemingly troubled road to production thus far. However, as Channing Tatum explains, they were having a tough time nailing down the tone and it just didn't feel right. Then Deadpool and Logan happened. The success of those two movies led the creative time to reevaluate things and that forced them to hit the reset button on the project, but that may be for the best. Here's what he had to say about it. "I look for a personal connection to the movies I make and it may not be immediately obvious...In every story, I have a personal connection...With Gambit, I just never found that personal way in. We lit a fuse on the first one and just blew it completely out of the water. I think we got lucky, we got hit with some setbacks and it was all for a good reason. We were trying to do something completely different. We were trying to do something that this genre of movie hasn't seen before. We kept running into the same problems, and then Deadpool and Logan came through and kicked the doors down. Now we're really getting to do some of the things we've always wanted to do with the script, we've just sort of started over." Channing Tatum offered a similar update during San Diego Comic-Con, but he didn't say that they had started over from scratch at the time. At one point, the Gambit movie had Edge of Tomorrow director Doug Liman attached, but as time moved on, Liman moved onto other projects. That may have been a blessing in disguise, as it sounds like Fox is much more open to doing some different and interesting things with Gambit now. Given how successful Deadpool and Logan were both critically and financially, why not? The card-throwing Cajun is a very popular X-Men character already. If they can nail the right story down, this could be a big hit. Fox recently announced six release dates for mystery Marvel movies; June 7, 2019, November 22, 2019, March 13, 2020, June 26, 2020, October 2, 2020, and March 5, 2021. If they can lock down a director and get the script right, it seems like a safe bet that Gambit could occupy one of those slots. At the very least, Channing Tatum still sounds very dedicated the project at this point. Let's just hope this works out better than X-Men Origins: Wolverine did.